Today we compare two, currently most popular pour over coffee makers Chemex and Bodum. True coffee lovers will not let them fool the aesthetics of the pour over coffee maker, they know what it takes to make a great coffee. Here we give you an overview of two excellent pour over coffee makers: „classic“ Chemex and „modern“ Bodum. What makes Chemex the best pour over coffee maker for many years? First we will start from the aesthetic look , because this is what primarily attracts our attention. Chemex is made of glass that does not absorb odors and tastes. It’s very easy to maintain. The pour over is decorated with a wooden collar and leather tie. When cleaning the pour over, you do not always have to remove the wooden collar, just pay attention to keep it dry while cleaning it. It will be enough if you clean inside of the pour over with detergent and brush once a week. The combination of glass, wood and leather gives it a sophisticated yet simple look. This pour over coffee maker is made of glass. These days we can find it on the market in two versions, the Handblown version that includes thicker glass, and the Classic version which is cheaper because it is made of thinner glass. You can damage this pour-over only if you drop it on the floor. As there are no moving parts it is difficult to cause a malfunction on it. You can buy it in several different versions that are determined by the number of cups it can make. So today , there are versions with 3-cup, 6-cup, 8-cup and 10-cup. 1-cup = 5 oz. And there are versions with or without handle. 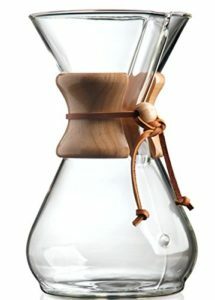 The filters that Chemex uses are made exclusively for this pour-over coffee maker. You can not use replacement filters produced by other manufacturers if you want the real taste of coffee that is the main characteristic of the Chemex pour-over coffee maker. The filters are made of paper and it is the consumable material. After one use, it is necessary to throw it away. Thanks to the density of the paper, the filter allows the coffee drip time to last longer, and this results in a stronger and more delicious coffee, which is the desire of every coffee enthusiast. Packages contain 100 filters. It is important to say that at Chemex pour-over coffee maker the length of the coffee filtration lasts about 5 minutes, and if you are a fan of „ tongue burning“ coffee, you will not get such a cup of coffee. The warmth of this coffee is perfect for drinking. If you did not use Chemex before we suggest that you buy Classic version but if you want to please yourself and the expensive price is not problem for you than you must buy Chemex handblown version. You will love it! With one look at Bodum’s coffee maker you see how a pour over should look like in the future. Unique and modern is its perfect description. It is made of mouth-blown borosilicate glass, a high quality glass that is heat resistant. Also, it is wrapped with a silicone sleeve which is made in different colors depending on your wish.Its aesthetic is more modern than the classic, and when choosing the colors of the silicone sleeve, it allows you to give it some personal expression. The Mouth-blown borosilicate glass from which Bodum’s pour-over is made does not absorb odors and flavors,it is high quality and easy to maintain. You can clean it manually or in dishwasher. Capacity is determined in oz. And you can buy it in several different versions: 17oz., 34 oz. and 51 oz. 1-cup = 4 oz. The filter that Bodum uses in making these pour-over coffee maker is a permanent, stainless steel mesh filter that does not absorb the flavors and aromatic oils that gives coffee that special taste. The filtration process is quicker than Chemex, so you can get an excellent coffee in just a few minutes. What’s also convenient is that you do not have to change the filter and therefore you do not have any additional costs after purchasing this pour-over coffee maker. Due to the speed of filtration, you get delicious and hot coffee in a short time. You can buy it in combination with a glass electric cooker and an electric coffee grinder. In this way, you have everything that you need for a delicious cup of coffee. Which one to choose: Chemex or Bodum? If we do not know what is good, then we know what is expensive. This is the policy we should be guided in this case. Based on the comparison, many would choose Chemex’s classic. Regardless of the higher prices and replacement filters that represent additional costs, the coffee that Chemex makes is characterized with strength and density, a coffee with rich taste. 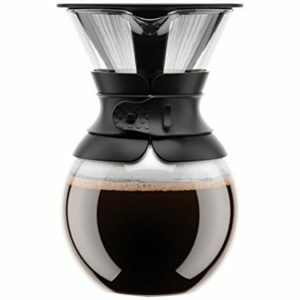 Although Bodum has good quality , is more sustainable, and easier to maintain, the coffee made by it is weaker compared to the one made by Chemex. Again, those who are willing to experiment can always add a paper filter to the Bodum’s filter and extend the filtration period and the density of the coffee, although it contradicts with Bodum’s policy that a paper filter is what absorbs the flavors and aromatic oils of coffee in which the coffee lovers enjoy the most. Of course, both of the products Chemex and the Bodum are the best of the best in pour over coffeemaker world. Which one will you choose depends on your personal taste.